1. 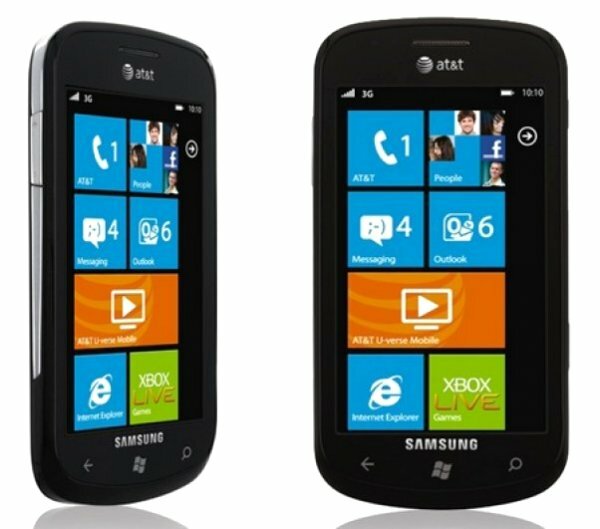 Samsung Focus – Samsung Focus SGH-I917 is one of the first Samsung smartphones to come out that runs on the new Windows Phone 7 OS. It measures 4.84 x 2.56 x 0.39 inches and is a bit over 4 ounces. The device is very handy and significantly lighter than other smartphones, infact it is the thinnest of the Windows Phone 7 devices. It comes at $200 with a two-year contract from AT&T. The rounded edges and 4-inch super AMOLED display make it look very sleek. The onscreen keyboard experience is near perfect too. It isn’t too spread out or too cramped in. It runs on a 1GHz processor which is not unlike a majority of Windows Phone 7 devices and has an 8 GB built-in memory, which is expandable with the help of a microSD expansion slot. Apps, multimedia games, internet, 3G run very smoothly on this phone. Apps like AT&T Navigator, AT&T Rado and AT&T U-Verse Mobile are also pre-loaded on the device. Slacker, Twitter and Facebook are all available on the Focus. The 5MP camera comes with a 4X digital zoom and LED Flash. And lastly, the call quality is excellent. 2. Apple iPhone 4– The most sought after phone – Apple iPhone 4, even though an year old now, is still top of the market , and beats all competition. It is elegant and tastefully made. 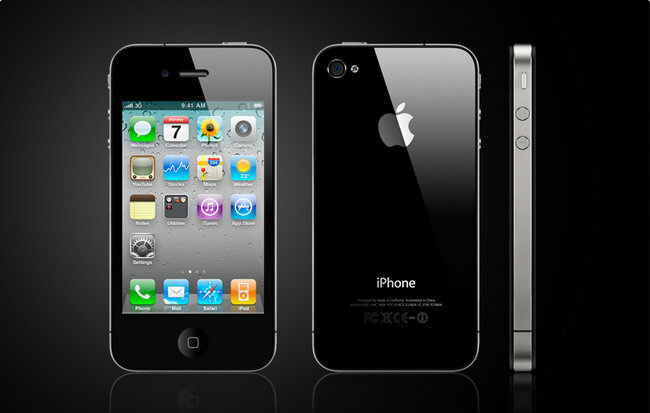 It is slimmer than the iPhone 3GS and narrower (2.31-2.44 inches), and weighs 4.8 ounces. It has a 3.5 inch display and a resolution of 326 pixels per inch, which is the highest available on a phone. The Retina display improves the sharpness and clarity of the images. The virtual keyboard is the simplest and provides great auto correction options. The iPhone 4 also has the best MP3 player, the iPod. It also has a movie player to provide enhanced experience, although it might not support all video formats. It has a 5MP Omnivision sensor camera that yields vibrant images that stay true to the subject of the photograph. The camera has an LED flash, backlit sensor and a 5X zoom. It has also managed to rectify the only two errors that came in the way of making it to the top – the poorly placed antenna and dropped data speeds, and the faulty proximity sensor which caused the phone to activate while making a phone call. Apple has come with permanent solutions to both these issues. Call quality has subsequently improved due to the correction as calls sound natural and without any echo. The iPhone provides a transcendent smartphone experience, and is worth the $399 (with a two-year AT&T contract) that it asks for. 3. Motorola Atrix 4G – Motorola http://www.myportableworld.com/wp-content/uploads/2011/07/motorola-atrix-4g.jpgAtrix 4G is a fast paced, multi-featured Android phone designed for the AT&T network. It is 0.4 inches thick, 2.5 inches wide and 4.6 inches tall and weighs about 4.8 ounces. The first unique thing is the fingerprint recognition pad on the back. The surface also serves as an on/off and sleep/wake button if you don’t use the fingerprint recognition feature. Atrix also has the Motoblur social media overlay software which puts in order your social media feeds and Gmail messages. It also offers a 5MP camera to record in 720P high definition, and another camera for video chat. The video calling quality is splendid, without any lost connection or call drop.The photo organizer software is an added bonus. All-in-all a wonderful device, provided the PC- smartphone nexus does not hamper the speed of either. The price of $199 (with a two-year AT&T service contract) is worth the device.